GMC Sierra the popular line of full-size pickup trucks continues to invest in their already strong reputation. Both light-duty half-tone model and HD series will benefit form particular improvements. The first is going to add a low-speed emergency braking system which isn’t something usual in the pickup segment. On the other hand, the 2017 Sierra 2500 HD brings the next generation Duramax turbodiesel engine. However, for the buyers who want enhanced off-road capability and matched styling the All Terrain X package will be available on both light-duty and 2500 HD version. So, let’s see what 2017 GMC Sierra All Terrain X models have to offer. 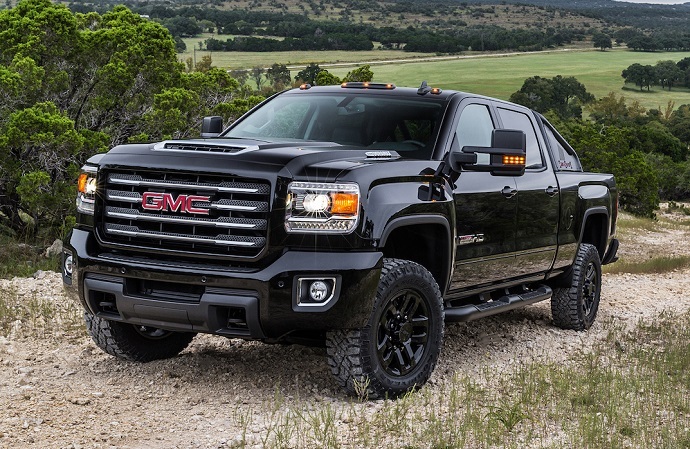 GMC has introduced Sierra 1500 and Canyon All Terrain X version earlier this year but this treatment will also be available for the HD models. For the Sierra 1500 mentioned package is available on the SLT All Terrain trim in both double and crew cab body styles. For this model the list of exterior body colors includes Stone Blue Metallic, Onyx Black, Iridium Metallic, Summit White, Crimson Red Tintcoat and Light Steel Gray. In case of the 2017 Sierra 2500HD this package is available on four-wheel drive crew cab models. Exterior colors are limited to Summit White and Black Onyx. 2017 GMC Sierra All Terrain X models will have unique bold looks which matches its elevated off-road capability. Both versions get body-colored grille surround and bumpers. The same application is reserved for door handles and body side moldings. The models also have standard bed-mounted sports bar that can add LED off-road lamps. The light-duty version has high-performance LED headlights with integrated LED DRLs. This model rides on 18-inch black-painted wheels. Tires are Goodyear Duratrac Mud-Terrain 265/65R18SL. On the other hand, Sierra HD model also rides on the 18-inch black-themed wheels wrapped in LT275/65R18 Goodyear Duratrac MT tires. This model also induces spray-on bedliner, four-inch black side steps, power-folding and heated side mirrors with integrated LED guidance lamps and turn signals. On inside models have an 8-inch GMC IntelliLink interface, leather upholstery, heated front seats, wireless charging, power adjustable pedals, remote start, rear vision camera, teen driver, etc. For enhanced off-road performance both models also benefit from the Z71 packages. In the case of light-duty version it means monotube Rancho dampers, transfer case protection, hill descant control, etc. Similarly, for the HD model this package brings transfer case and underbody skid plates, twin-tube Rancho dampers, off-road information graphic and hill descant control. Under the hood of 2017 GMC Sierra All Terrain X light-duty model is standard 5.3 liter V-8 engine. Thanks to the All Terrain X performance exhaust system this engine can produce 10 additional horsepower. In total its power ratings are 365 hp at 5,600 rpm and torque of 383 lb-ft at 4, 100 rpm. All-wheel drive is standard and an Eaton auto locking rear differential. On the other hand, Sierra HD offers two engine options. Standard is a 6.0 liter V-8 engine. It can produce 360 hp and torque of 380 lb-ft. As an option this model adds improved 6.6 liter V-8 Duramax turbodiesel. New-gen version of this engine can now deliver 445 hp and impressive torque of 910 lb-ft. This model also has standard all-wheel drive system with automatic locking rear differential. 2017 GMC Sierra All Terrain X HD version will arrive at dealers in early 2017. This version of the light duty model is already available and base price is around $54, 000.